Trevor Gage's Burrell Traction Engine. Trevor Gage thought his first model should be something of a "Think Big" project. 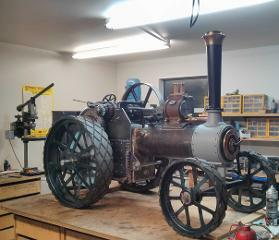 He has recently completed a magnificent 4" scale Burrell Traction Engine that certainly fulfils that dream. The model is remarkable in a number of ways. First it took Trevor 4 1/2 years to build. Second it is his first model. Looking at this excellent model it is easy to appreciate what a fine achievement it is. At the 2014 CSMEE Awards Trevor won the Moody Cup (Best Model), Edsall Award (Best First Model) and Kevin Welsh Cup (Best Road Vehicle). The model is a 4” scale (1/3rd full size) single cylinder Burrell Traction Engine. It is no lightweight. The boiler is made of steel and steams well. This gives it plenty of power and Trevor has already had enjoyable afternoons driving it around. Click on the video below to see a video of the initial test engine running of the engine. Traction engines became popular in industrialised countries from around 1850 when the first self-propelled portable steam engines for agricultural use were developed. They revolutionized agriculture and road haulage at a time when the only alternative was the draught horse. Charles Burrell & Sons were well known builders of steam traction engines, agricultural machinery, steam trucks and steam tram engines. The company was based at Thetford, Norfolk. At their height they employed over 350 people and were the largest employer within the town. Burrell’s became known for producing reliable and good-looking steam-powered engines which were always built to customers' requirements. The company declined after the First World War when internal combustion engines started to become a cheaper alternative to steam engines. The company finally closed in 1928. Traction engines tend to be large, robust and powerful, but also heavy, slow, and difficult to manoeuvre. Trevor has captured the essence of the original but does say it is real fun to drive. There are numerous preserved traction engines, many in working order. However experiencing Trevor’s model is almost as good as the real thing.